Rare, original, GPO antique bakelite telephone. This is the classic 1930s British desk telephone (232), lovingly restored to a beautiful condition. Supplied with a modern BT plug as standard, or with a suitable plug for your network if sent to a different country. Fitted with an authentic internal mechanical bell that rings to indicate an incoming call. All telephones have a 12 month guarantee. We also offer a full repair service. We often hear from people who have recently found our website, that they always wanted an original authentic bakelite telephone, but didn't know where to find them and, if they did ever come across one, it was usually in poor condition, didn't appear original, looked as if it might not work, or was priced way beyond their budget. 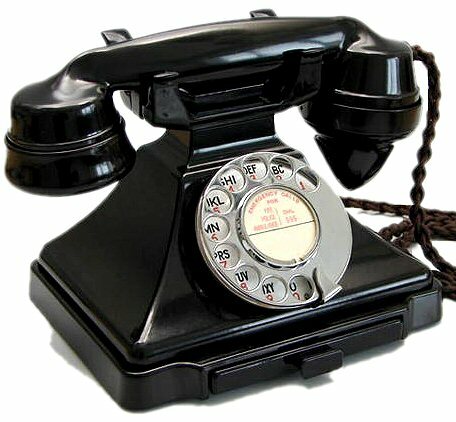 We are therefore pleased to offer our genuine, high-quality, restored and working classic bakelite telephone range to those who wish to have the peace of mind that their investment represents value for money, is protected by a guarantee, and can be backed up with a full repair service if ever needed. These phones will work in virtually every country and, in many cases - if you let us know beforehand - we can make sure the telephone is delivered with the correct plug for your telephone network. All telephones have a 12 month guarantee. We also offer a full repair service. The 200 series bakelite telephone or "pyramid phone" was designed in 1929 and became the GPO standard phone during the 1930s, preceding the 300 series telephones.